20% Discount for Thanksgiving 2018 ONLY! Our 2018 Thanksgiving Rental has cancelled. We are offering a 20% Discount and flexible on dates. If you don't already know, Chatham is a magnificent destination for Thanksgiving week. The house is located between the Chatham Bars Inn and Lighthouse Beach, on the Ocean side of Shore Road. It's an easy walk to Chatham's beaches, fish pier, lighthouse, town center, outdoor band concerts, fine restaurants, Chatham Bars Inn, golf, tennis and restaurant facilities. Walk to four swimming beaches, including Lighthouse Beach. The home sits on .9+ acres, and has a huge back yard with organic vegetable and flower gardens. There is a garage, a workshop, and a kids ''outback'' bedroom and shower -- adjacent to the garage structure. 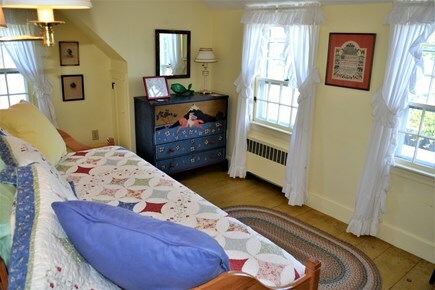 The home is well equipped and well maintained -- and is situated in perhaps Chatham's most desirable location, just down from the Chatham Bars Inn and Lighthouse Beach. 200+ photographs available upon request. 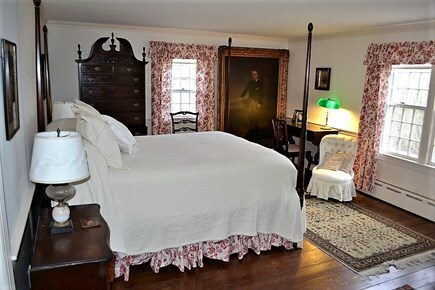 To learn more details about the immediate area, visit the Chatham Bars Inn website. Additional availability info: partial week rentals considered with 1 week minimum. This is a Saturday to Saturday vacation rental. Additional pricing info: mandatory cleaning: $250 / wash and fold our linens $220 / $180 rental insurance, State and local taxes of 12.45% will apply. 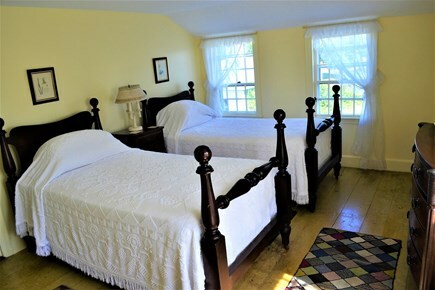 On the first floor, we have a master suite and small small bedroom with private bath. Thank you for sharing your beautiful an gracious home. It accommodated the family quite well. The garden is simply spectacular! We will cherish our memories of our Chatham vacation forever. The lawn and gardens are spectacularly beautiful. We had a family of eight, representing three generations. Thus, we found the large living room a great common room in which to talk, read, and play with our infant grandchild. 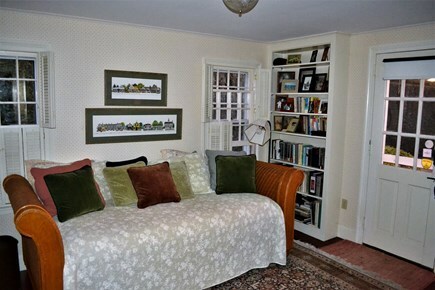 In addition, the room overlooking the gardens providing additional space for reading and watching television. The dining table, which sat 8 or 10 comfortably was an asset when we had friends visit for a dinner. We ate twice at Chatham Bars Inn, which is only two blocks a way, went on a marvelous sailboat ride out of Wequassett, enjoyed a seal watch boat ride in Chatham harbor, and arranged for cooked lobster from the Chatham fish pier, only a few blocks away. We also walked into town every morning and had coffee on the way, and most of us participated in Yoga on the beach at Lighthouse beach every morning. Several of us enjoyed the shopping in Chatham , which has unique shops, etc. The children especially enjoyed the beach, which is a National Preservation site located beyond Lighthouse beach. Thank you for your hospitality. The house and grounds were immaculate. Our family had a great time enjoying your home and Chatham. We can't wait to come back soon! We were late getting there because of our flights and the owner had breakfast items delivered for us! Very nice! The grand old lady was very eccentric and quirky. My teenagers thought she was haunted and loved exploring. The house lent itself to family game nights and puzzles. The grounds and exterior are gorgeous but the interior was a little tired. However the master suite was very nice so the two adults were covered. The house really would not sleep more than 4 adults comfortably if no children were along unless you put the kids in the garage apt. Overall since the location was prime we had a lovely time. Check out was way to early though!!! There is no ocean view but the secret path to the private viewing beach was awesome! Thanks for a special vacation and lots of memories!! 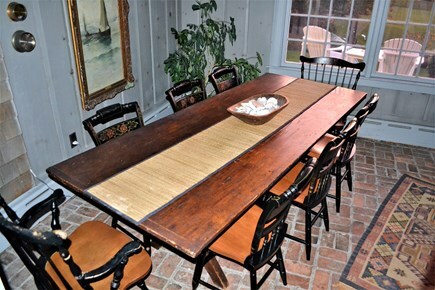 Thank you so much for sharing your gorgeous home with us on for very first trip to Cape Cod. The Cape is heavenly, we hated to leave. We had such a wonderful time in your special home. Memories we will cherish forever. We had the most wonderful time in Cape Cod. Our children loved your home -- making good use of the bats and balls, climbing trees and catching crabs on the beach. Your house is just heaven! Our kids will return to Dublin (Ireland) with the greatest of memories. 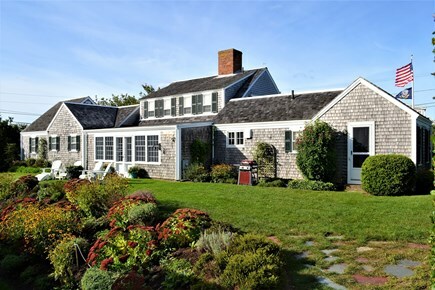 The Briggs House is the quintessential "old Cape Cod" vacation house. It has everything a guest could want, from lobster crackers and lovely antique furnishings to a location within easy walking distance of some of the Cape's best beaches and the pretty village of Chatham. The long green lawn—perfect for a Frisbee game—and well-tended flower beds invite guests outdoors. Couldn't have asked for a nicer Cape vacation. Thank you! OMG! What a house! It was Perfect! My dear friend and I has the best time. We cooked and brought in lobsters and just loved our time there. 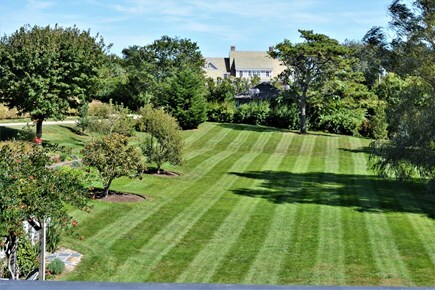 The yard and grounds of this property are beautifully maintained. The location is perfect! 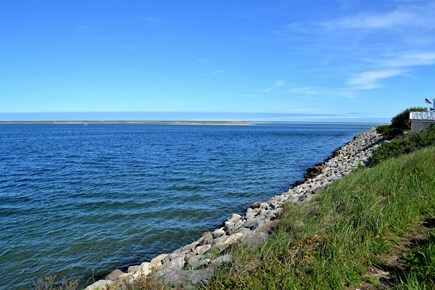 An easy walk to Lighthouse Beach, Chatham Bars Inn and the town of Chatham. 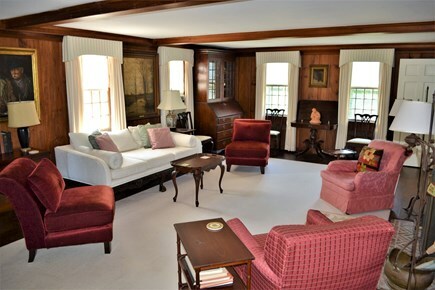 The house is cozy with many interesting antiques, old photographs and pictures. 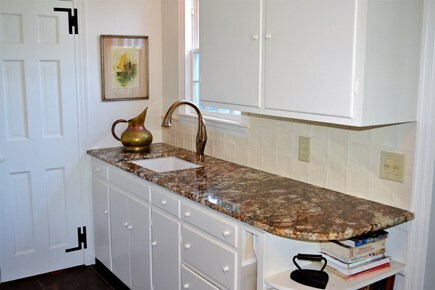 It was well equipped with everything we needed in the kitchen and throughout. The pictures and description of the house accurately portray what you can expect.